Looking for the perfect pillow to enhance the joy of sleeping? Here we are with all necessary details which you need to find a perfect pillow as once you have experienced the exceptional comfort and support of the right pillow, you’ll wonder how you ever got to sleep without it. Many of us aware that the most common cause of neck pain is prolonged abnormal posture during sleep; Using very high or very thin pillows causes that pain which can lead into cervical pain which is very harmful and irritating as well. For ideal support the spine should remain level and in alignment, and the pillow should tuck into the neck/shoulder, it should be the right consistency and height to relax your neck and shoulder muscles, and to provide the correct support and body alignment for you. How to choose right pillows? It is good to check your sleeping position when choosing your pillow. If you sleep on your back or stomach you might prefer a soft or medium pillow so that it will mould to your head and neck to give you comfortable gentle support. It is good choose a firm or dense pillow if you sleep on your side to get more support for your spine, head and neck in that position. If you suffer from neck problems, an orthopedic pillow or memory foam pillow may provide the shape and tension you are after. Pillows come in more or less the same materials as mattress in standard sizes 14" x 22" and 16" x 24". Cotton or silk cotton was commonly used and occasionally latex rubber. Today, synthetics are taking over, and so we have polyester and polyurethane pillow foam pillows as well. Before making a purchase for a new pillow it is good to have a look at your sleeping habits. If your head is barely resting on the pillow, you might want to consider a thin pillow. Do not use synthetic fiber pillows if you have asthma or any kind of other allergy from synthetic fiber. Ideally a pillow should support the neck and shoulders as well as the head. The perfect pillow should be the right consistency and height to relax your neck and shoulder muscles, and to provide the correct support and body alignment for you. -	Standard Pillow: 20" x 26"
-	Queen Pillow: 20" x 30"
-	King Pillow: 20" x 36"
-	European Pillow: 26" x 26"
-	Body Pillow: 20" x 54"
-	Travel Pillow: 12" x 16"
Pillows come in a range of natural, man-made and specialty fillings such as feather, down, cotton, synthetic, silk, latex and memory foam you can choose any of them according to your sleeping habits and requirement. There are a variety of different shapes to choose from such as V-shaped, large square, super king, square, cushion pad, cot bed pillow, bolster and your standard pillow shape. Natural down pillows are the most luxurious one as air trapped between the feathers or down gives the pillow bounce and helps it to mould to the shape of your head. The higher the quality of down, the softer the pillow will feel. Synthetic pillows can give a down like feel if filled with highest quality of synthetic, choose pure cotton casings for maximum comfort and ventilation. Silk is another option for a non-down pillow which should still feel soft and bouncy. It is good to choose a silk pillow with a 50% polyester content will prevent the pillow becoming too flat. They are hypo-allergenic and, overall, the most affordable type of bed pillows. Memory foam pillows are made from visco-elastic foam, which is high density, temperature and pressure sensitive material that reacts to body heat and weight and moulds to the exact contours of your body. It is hypoallergenic, can help to relieve neck pain and tension and may be ideal for people who change position a lot while sleeping. 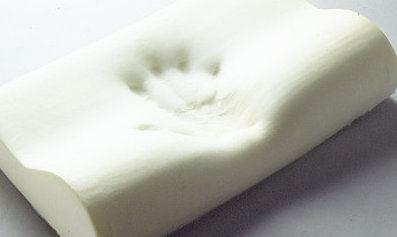 Latex pillows are made up of Latex which is a natural material derived from mature rubber trees. It comes in a range of tensions and its gentle resilience enables the head to be comfortably supported in all sleeping positions. 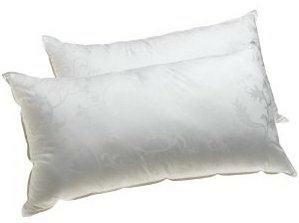 Latex pillows are also hypo-allergenic and have an aerated interior to keep the pillow ventilated. You can choose any of the above mention pillows according to your sleeping requirement and habits but remember that the life cycle of a pillow is usually 2-4 years so it is good to change your pillows after every 2 years to getting the best from your pillows. It is also good to use pillow protector and a pillowcase. Pillow protectors can be found in fabrics that range from cheap synthetics to fine expensive cottons. Changing pillow cases frequently will allow you to freshen up the bed and can also keep your face and hair cleaner.